Seen at the Swansea Bus Museum Running Day was this AEC Regent V MD3RV010 bearing Weymann body M6709 H33/26R and new to South Wales (447) in 1955. 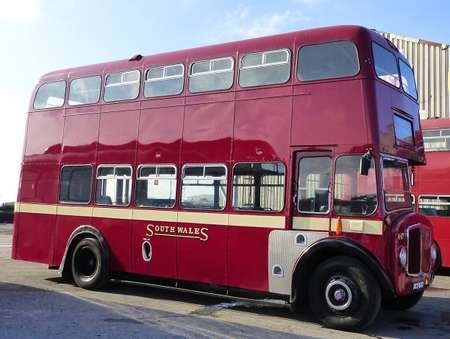 South Wales were loyal AEC customers over the years. For several years the livery was all-over red without the cream waistband. A lovely photograph Les, and thank you for posting it, as it brings back happy teenage memories. Sister vehicles MCY405/8 were acquired by Samuel Ledgard in late 1966, closely followed in early 1967 by NCY453/5 from the 1956 batch. When "Sammie’s" was taken over by West Yorkshire in October 1967, the South Wales quartet were among the vehicles retained by the Company, and were given fleet numbers DAW1-4. Initially allocated to WY’s Otley depot, the vehicles were later transferred to Harrogate, where they soon settled down to duties on local services 1/2 Bachelor Gardens-Woodlands, and 9 New Park-Oatlands, plus occasional stints on the 11 Roche Avenue-Cawthorn Avenue and 12 Fountains Avenue-Starbeck routes. Their delightful melodic tones and wonderful throaty exhaust notes immediately endeared my brother and I to their charms, and at every opportunity we would endeavour to catch one into town, even though this meant a five minute walk up to Skipton Road from our usual stop on King Edward’s Drive. As I had a morning paper round covering Bilton and Bachelor Gardens, I was also party to ‘The Regent Symphony’ early each day, when often the only other sounds to break the stillness were birdsong or the occasional car. The sound of the AECs barking away up Bachelor Gardens or the Hill Tops could be heard quite a distance away, and gave an indication of whether I was running late, or to time on my busy round. I’m not sure if the residents living along the route would have shared my love of such sound effects, but as a 14/15-year old, I no doubt felt that "sometimes there’s just no pleasing some people!" My word, surely one of the best ever pictures of a superb preservation achievement. To think that our Ledgard quartet, as described above by Brendan, once looked like that !! Much as I loved them in Ledgard territory I was never as lucky as Brendan in hearing them bellowing their lusty way up the steep Skipton Road from the A 61 Ripon Road – and in one of the lower gears the contralto/soprano accompaniment from the gearbox must have been glorious !! 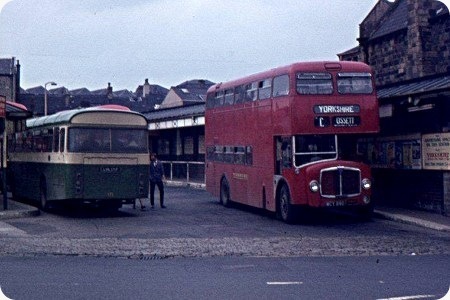 I would imagine that the use of these Regent Vs by West Yorkshire must have been a rare case where drivers preferred buses from an operator taken over to their own native stock!